Digg today released a Reader extension for Chrome. You can download the new Digg Reader for Google’s browser now directly from the Chrome Web Store. Tells you when you’ve got unread items, and how many. Lets you add the web site you’re currently viewing to Digg Reader with a single click. Opens Digg Reader in a new tab with one click. 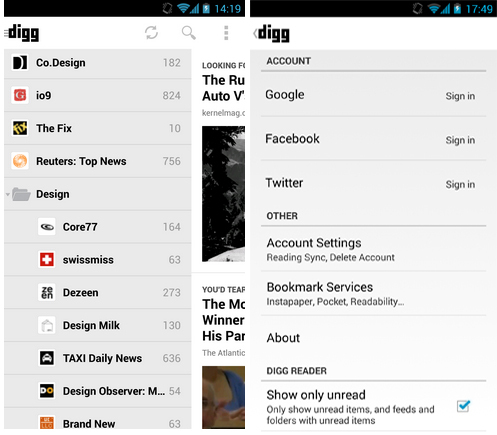 At the same time, Digg also updated its Android app. You can download the new version now directly from Google Play. Digg Reader version 1.4 for Android has a very straightforward changelog: “Added a setting to only show unread items, and feeds and folders with unread items.” If you access Digg Reader across multiple platforms (the Web, phone, and a tablet), this is a critical feature. Digg also says the update includes “a ton of bug-fixes” and you should “notice a faster, smoother, zippier app.” You can give feedback and make feature requests here. One of the reasons I quickly dismissed switching to Digg Reader was because it didn’t display the number of unread items in its tab’s title. With the new Chrome extension and the new unread mode on Android, I’ll have to give it another look. Digg Reader is a decent alternative to Google Reader, but since Google Reader’s demise, competition has gotten very fierce. Without frequent updates, your favorite RSS reader can quickly become outdated and slow, prompting the search for yet another alternative.